Earlier today, as I was driving Over the Bridge to do some shopping, I had all these clever ideas for a blog post racing through my mind. That was ten hours ago, and I can't remember a single one of them. Other than the one where I feel giddy and excited every time I walk into a Whole Foods because it makes me feel so grown up. No, really! It wasn't until I was 30 that I had either the money or the knowledge of a (largely) organic grocery store, so walking into one makes me feel like, "I have ARRIVED!" (throw your arms wide and be very Broadway-dramatic about it when you say it). Thirty was a very pivotal year. But I'll write more about that on my 42nd birthday next month. So stay tuned. While Over the Bridge, I paid a trip to Paper Source to buy a ton of cards for my Pay It Forward project. I can never leave that store without ten times what I meant to buy. I nabbed Christmas cards to make for next year, Valentines for Zack's class for next year, and a ton of awesome cards to mail out in the coming month. 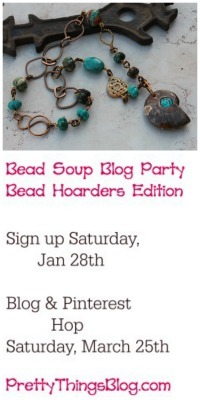 Other than those two things, my mind's a blank, so thank goodness it's Bead Table Wednesday! I'm not going to show you my actual work mat, because that would ruin the Cup of Bead Soup surprise that will be posted soon (hopefully tomorrow! ), but I'm going to show you three things that are ALWAYS on my work table no matter what. First, there's my handy dandy tool caddy. This is actually a desk organizer I found at TJMaxx. I looooove me some TJMaxx, Marshalls, and Ross. I've learned to look at things not for what they are, but for what they could be. Lindstrom RX tools, beading wire, tiny tins of oxidized jump rings (bigger tins of regular sterling rings are below the open drawer), a plastic box of plain spacer beads and a plastic box of ear wires; a calculator to figure up the cost of a piece of jewelry, seed beads to fill the holes of lampwork beads (so they don't wobble on the beading wire); a box full of bags of various types of head pins, a box of hand-cut earring cards and hole punches; super-glue, chapstick, and alligator clips. Exciting. Whee. Strike up the band. But as mundane as that photo is, it's the powerhouse of the whole operation, isn't it? Our money is spent on just the right tools, since our hands must be treated well, and we couldn't make anything without beading wire and headpins (don't get me started on my wire drawer). So boring to look at -- yes. Exciting possibilities -- oh yeah, baby. I know I'll use them soon so I'll just. stick them. right. there. These guys were made for me by a wonderful artist and friend I met on the craft show circuit, Ayenne of Whimsee Pots/AvivaArts. I just walked around the house and counted ten pieces of her work, NOT including these, so you can safely say I'm a fan. The small one holds my silver scrap and the large one holds bits of paper trash and such. Behind the cup is a boro glass pen holder with a pen I adorned with a fabric rose, a bracelet sizer, and a bowl filled with various sizes of plastic bags. I store all my jewelry in those little plastic bags because when sterling silver and air get together, the sulfur in the air reacts with the silver to create tarnish. If I store things in those oh-so-glamorous baggies, I don't have to constantly be cleaning things. I was at the Annapolis Whole Foods today too! 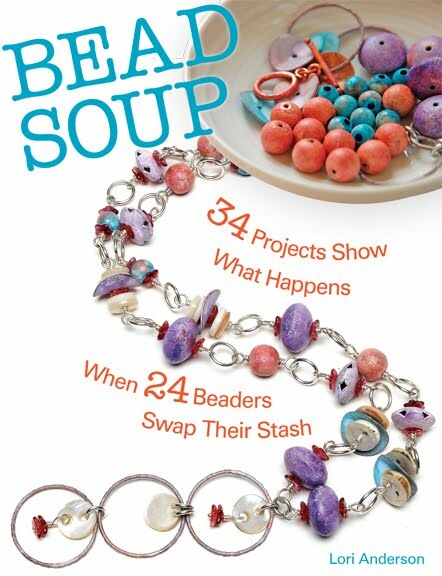 Also - thanks for the link on the bracelet sizer - I've been beading for over 16 years and have never seen something like that. 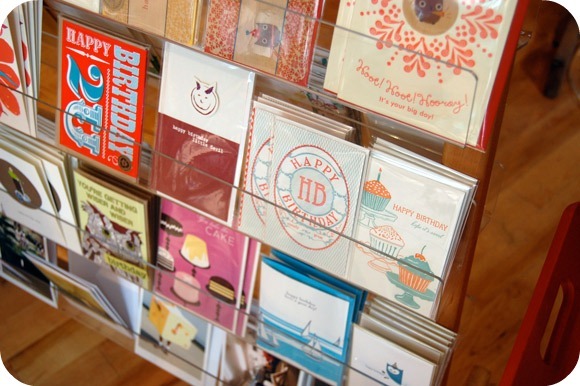 I could spend days looking at cards...I just love them! I don't put all my things away either, I am afraid I will forget about them...so LOTS of things sit on my work table and wait their turn. I love to see where other artists create, and I learned something very valuable. Today I have on a lampwork bracelet and my beads wobble. Now I know what to do next time. Thanks, Lori for sharing! OMG, Amy, we could have passed each other! The bracelet sizer is really the only accurate way to measure a bracelet -- you can't measure a bracelet linearly, against a ruler, but have to take into consideration the size of the beads. You need the INNER measurement of the bracelet, which is what the bracelet sizer does for you! Love your bead table. It's so well organized! Sigh! It may be a bit chaotic, but oh, so organized! You have a place for everything...yes, I'm jealous! and I love Whole Foods, and feel exactly the same way every time I walk in! We lovingly call Wholefoods "Wholepaycheck"
I'm soooooo jealous of your organization! All my stuff is just kind of hectically dumped into a shoebox...not good! And thanks for the link to the bracelet sizer! 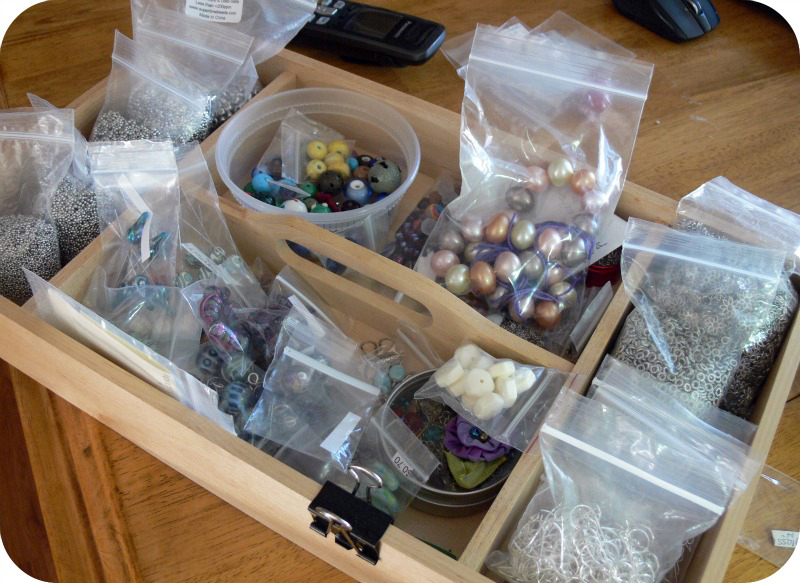 i love your Ikea drawer turned bead organizer..want that..
and the bracelet sizer..want that too. i am laughing a little about WFM..i worked at their very first store in Austin..and their second store too..believe me when i tell you they looked nothing at all like these super stores. at one point i was the greeting card and housewares manager..shhh. that was another lifetime ago. I'm sorry. I could hardly get through the bead post because I read "Over the Bridge" first. I. hate. bridges. Seriously awesome post. I love peeking into your creative world. And I am SO jealous - I want a Whole Foods. Heck, I love in the country and our farmers market usually consists of -maybe- 8 booths of local food. I always love to see others workspace...of course, yours is SO neat! How is it everything seems to be "over the bridge." Hope you had a great day! Thanks for sharing your wonderful space and organization ideas with us! 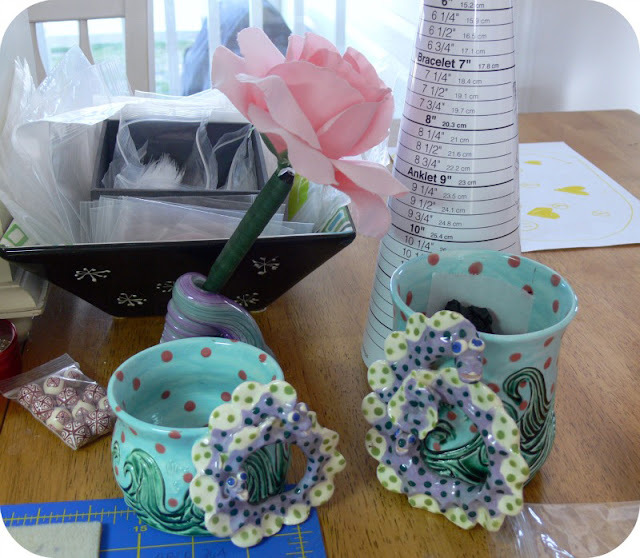 Great "work table tour", Lori! I bought a bracelet sizer about a year ago but it won't stay glued together. What do you use to keep it together? Thanks for the good ideas you shared. I'd love to see a post where you show us some of the tools you use on a daily basis. I'm heading right over to IKEA for one (or several) of those silverware trays! Brilliant! As for large organic groceries, for me they spell "big city" since in rural Vermont, we have to travel to see that much organic food at one time-- other than my chicken house and garden, that is! And I can't forget when my best friend gave me a planter- an elongated bottom with three matching pots. I looked at her and said, "you know this won't be used for plants, right?" She replied, "I figured." I was wondering where you buy your bulk bali beads? That was an awesome peak into your day! I am sitting here in awe of all your tools and organizers and such! I was picturing you sitting there getting your inspiration and thought hey that could be me someday! 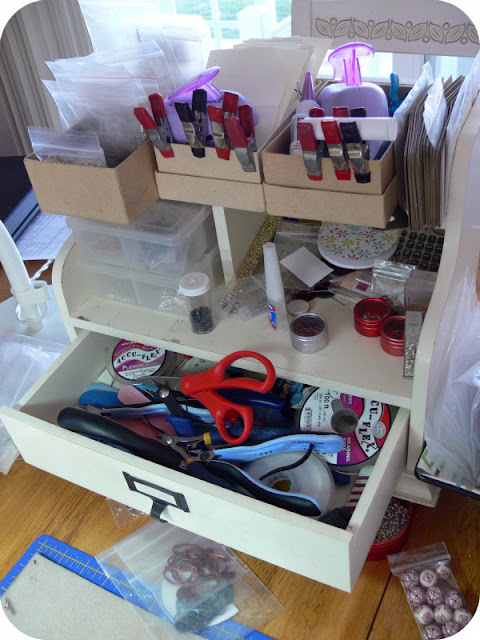 I have container envy :-) I am a pushover for caddies, drawers, boxs, and tubs of all makes and sizes. Surprised to see your Whole Foods photo, but it's a good thing! We have to travel 2 hours to the nearest one, aka "Whole Paycheck"! There is a new WF in Kahalui, Maui, where we just spent almost 3 weeks, due to ice storm that closed Dallas airport, sigh :) I'm very inspired and motivated by your BTW pics, YES! 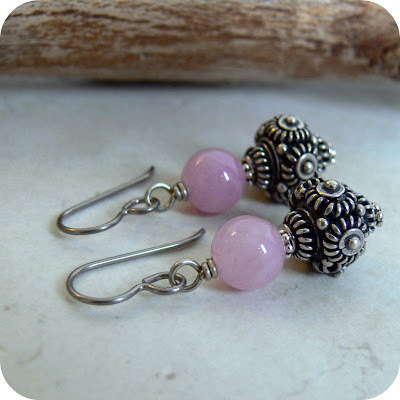 Love TJ, but have never found anything that I could adopt to my jewelry needs, yet. I've been thinking of rounding up some silverware trays that are around the house, already using one for personal necklace storage in my dresser drawer. I plan to post the results when my "new" bead area is ready for the public. 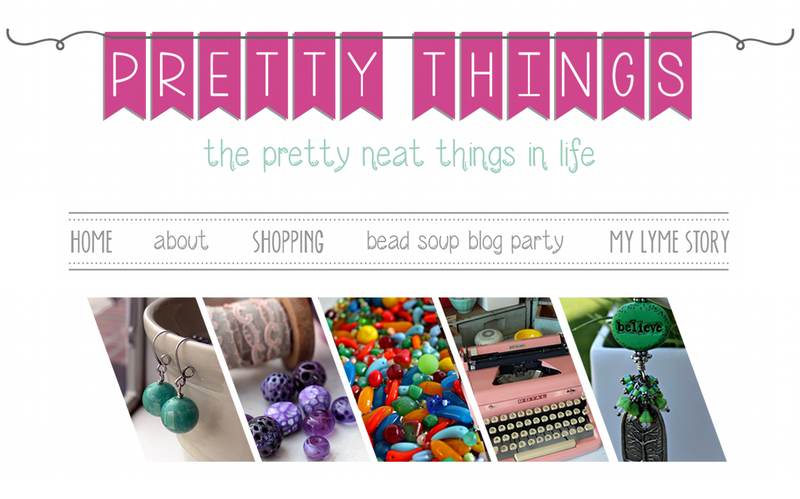 I have a Maui beady-buddy story up now, fun to see a Maui-style success story! Look for an e-mail from me about sleeping!! 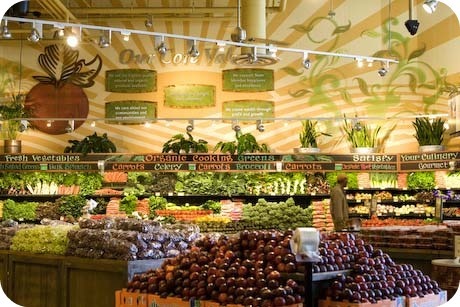 I love Whole Foods too - was so excited when we got one here in Richmond. 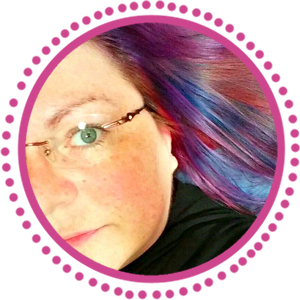 It's really great to see who others organize and what tools they use. Question - do you sit and make a bunch of ear wires or a bunch of jump rings at one time? Love whole foods, but there isn't one here where I live, so I only get there once a year ....boo. Love our organization....well done, I do have a method, although not quite so pretty! Thanks again for your kindness and support. I know what you mean about keeping bags of beads within sight or you will forget you have them! 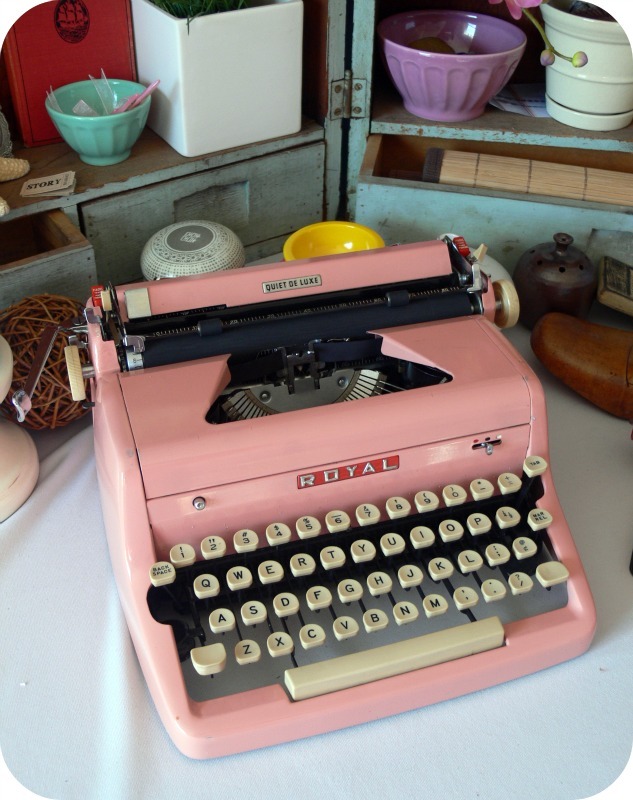 Loving the pink typewriter too by the way, I've never seen one before! i've been thinking of a tray like that from tj maxx or ross too! i just reorganized and i want it to look pretty, since it's in the living room. i'll have to go now, yours looks so nice. i know what you mean about needing everything out there. i've been trying the "put it away when i'm done" thing the last week and i don't like it. i miss the inspiration of all my crap sitting there.